Home news BREAKING: ADEYEMI’S STATEMENT THAT HE DIDN’T KILL KHADIJAT- IS AN INFANTILE DEFENCE, SAYS ONDO POLICE. BREAKING: ADEYEMI’S STATEMENT THAT HE DIDN’T KILL KHADIJAT- IS AN INFANTILE DEFENCE, SAYS ONDO POLICE. 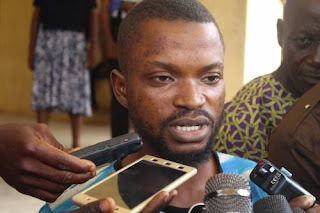 The police in Ondo state have described the confessional statement of Seidu Sakiru Adeyemi, who denied killing Khadijat Oluboyo, daughter of the immediate past Deputy Governor of Ondo state, Lasis Oluboyo, has an “infantile defence”. 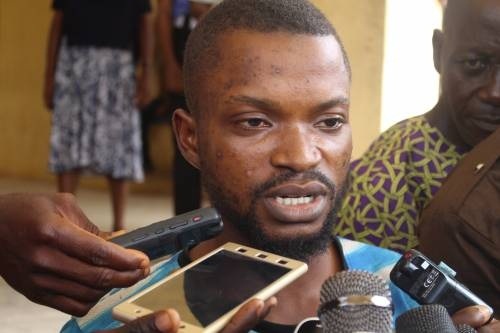 Femi Joseph, spokesman for the Ondo State Police Command who spoke said Adeyemi lied by telling journalists that he did not kill the twenty-five year old final year student of Adekunle Ajasin University Akungba Akoko. On Wednesday, Adeyemi had told journalists at the police headquarters in Akure that he did not kill khadijat but claimed that two men invited by the deceased murdered her. “I received a text message from her that I should send her N2, 000 but I was only able to raise N1,000 for her because I didn't have much money. “But few hours later, I heard a knock on my door and when I opened, she [Khadijat] was the person I saw and I quickly asked her why she didn't tell me she was coming to visit me. “Shortly after, she went out of the room and called in two other boys. She said a boy would be visiting her, but when she came in with the boys I was not comfortable and had to excuse them. “Later, one of the boys came out to call me and by the time I would enter back into the room, they were with guns and they threatened me. “One of the boys was even on top of Khadijat on the bed and ordered me to kneel down on the rug and threatened me not to make any move but later they told me to go out and bring a digger. “By the time I would come back, they had already killed Khadijat and asked me not to tell anyone and they instructed me to dig a big hole so they could bury her…” Adeyemi told journalists. But reacting further, Mr. Joseph said Adeyemi killed khadijat, and not the two fugitive men he claimed earlier in his confessional statement during yesterday’s press interview. He said the police was alerted by an informant about the devilish act of Adeyemi when the corpse of the deceased already smelled out of the room. The police spokesman narrated how the culprit was caught red-handed by the police while trying to exhume the corpse of late Khadijat right inside his room in Akure. Joseph explained Miss Khadijat was tricked to Akure by the self acclaimed boyfriend before she was murdered. He said that Adeyemi would be charge to court to face justice over the killing of the daughter of the former Ondo deputy governor. “On the 6th of this month, we [Police] were alerted by an informant about what happened and we went to a house of one Saidu Adeyemi, who happens to be the boy friend to Khadijat. “Unfortunately, when we got in there, we met him trying to pack the remains of Khadijat that is to tell you that he had killed her. “He killed khadijat and single-handedly looked for digger, dug a grave in his apartment [room] and buried the lady. “After few days he [killer] noticed that the stench of the decomposed body of khadijat was making him uncomfortable. “Apparently sensing danger, he had to tell somebody to help him get a sack so that he could park the remains of khadijat and disposed them off but that was how we swooped on him and got him arrested. “So, his story is too good to be true, the reason is that if you are saying that two men came in to attack Khadijat, we talking about six days now when those two men came in did’nt you raise any alarm. “He [Adeyemi] admitted that he was still the same person that went outside when the two men told him to go and look for digger, he had the opportunity and yet he did not shout for help. “You know when criminals are put to a very tight corner like this, they are always been funny. I think he is being to be clever by half. “We know how to deal with people like him but by the time we get to court he would surely have his days. “Let him go and inform the court and let us see how he would get out of that way. “His [Adeyemi] defense is too infantile and doesn’t hold any water because he should begin to talk to court in the next twenty four hours.” Joseph said.